Chang Chieh-kuan, a Taiwan printer, is dedicating to keeping the ancient art of Chinese character movable lead type alive in the digital era. He owns one of the only remaining foundries that still casts lead type from copper molds for thousands of Chinese characters. Because there is no alphabet in Chinese, putting together all the characters to print even a few words is hugely time-consuming, never mind the 4000 or so characters that make up the average novel. Chang’s Ri Xing Type Foundry has 2 million individual pieces of lead type. Handwritten Chinese, using brush and paper, is considered an art form and an indicator of its practitioner’s scholarship and aesthetic sensibility. In communist China, many characters have been replaced by simplified forms to promote literacy, but purists say they lack the heft and balance of the originals. Taiwan, an island of 23 million people 160 kilometers (100 miles) off the Chinese coast, still uses the traditional versions, regarding them as the heart and soul of Chinese culture. 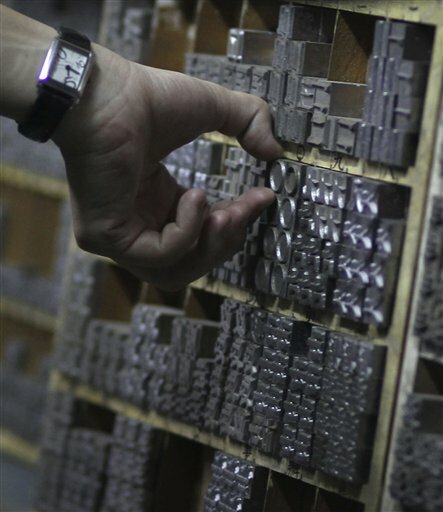 The older characters are also in use in Hong Kong, though no movable-type foundries exist there. And everywhere, word processing is threatening to make the old skills extinct. Chang is dedicated to preserving this cultural and historical asset, no matter how obsolete it may seem. Movable type was invented in China, after all, in 1040 A.D., a full 400 years before Gutenberg developed the printing press in the West. Its inventor, Bi Sheng, used wood type, but that was soon abandoned in favor of clay which had no grain nor warping problems after being soaked in ink. Metal type took another 200 years to appear, first in Korea then throughout the Mongol Chinese empire. When Chang’s uncle started Ri Xing Type Foundry in 1969, there were 5000 print shops in Taipei. Now there are only 30 of them left, and Chang’s is the only remaining foundry. To keep this thousand-year-old tradition alive, Chang has had to sell his family home, and since the print shop hasn’t actually turned a profit in 10 years, he created a museum of movable type where people can buy lead characters as novelties. They look totally cool. He needs to get a website up because I bet people from all over the world would buy them for the coolness alone. It would be wonderful to see a dying traditional craft benefit from the Chinese character trend so overused in tattoo art.